It’s all about the bling! 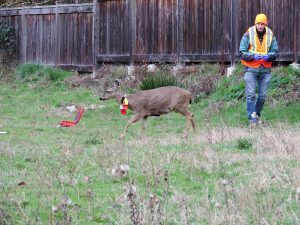 Tracking urban deer to manage human-wildlife conflicts. 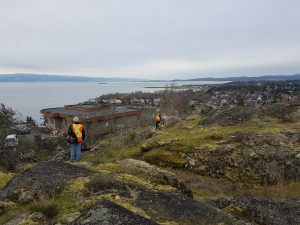 It’s just another winter morning in Oak Bay, temperatures hovering around zero, the first hint of sunlight peeking out…and a group of wildlife bios, a couple of vets, and members of the Urban Wildlife Stewardship Society congregating in a parking lot. As you do, when the dawn plans are to stealthily search the streets for deer, black-tailed deer (Odocoileus hemionus columbianus) to be exact. 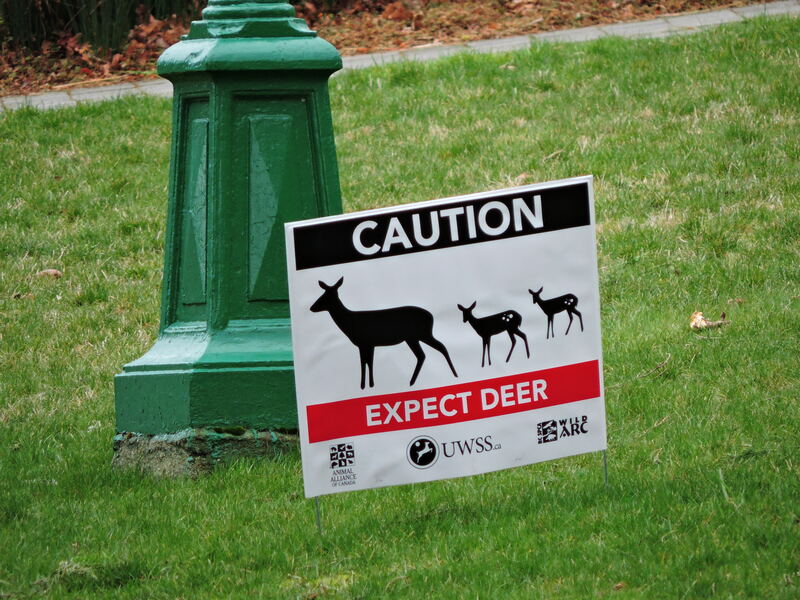 I am fortunate to be part of the team of wildlife biologists assisting with an urban deer project. The Urban Wildlife Stewardship Society is committed to evidence-based and sustainable, non-lethal solutions to human-deer conflict in urban areas. 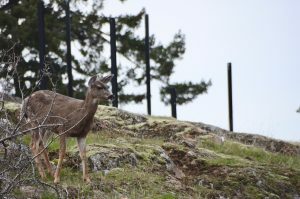 In collaboration with academics – the Applied Conservation Macro Ecology lab at UVic and the Wildlife Coexistence lab at UBC – the Society has obtained funding to gather rigorous data on deer numbers and movement patterns, which will provide the municipality with the science needed to make informed, evidence-based decisions on how to manage Oak Bay’s deer. 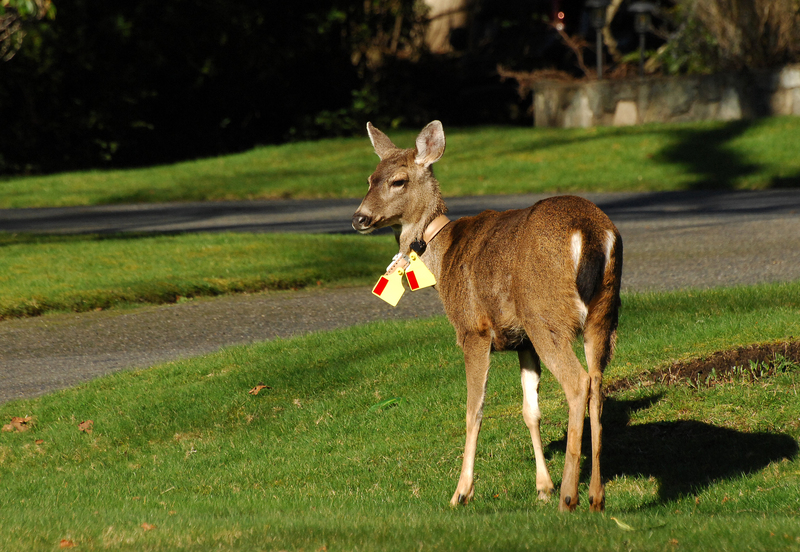 The plan is to put Global Positioning Satellite (GPS) collars on 20 female deer. 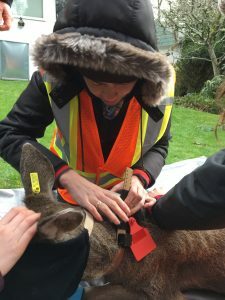 Twice a day for two years the collars will transmit the location of the doe to a satellite, which will in turn beam that location back down to the Society researchers. In addition to putting on the collars, the vet will take blood and hair samples for analysis in the lab, and record pertinent information about each animal’s health and body condition. In addition to the twice-daily GPS locations, the collars have also been fitted with colour-coded reflective tags. 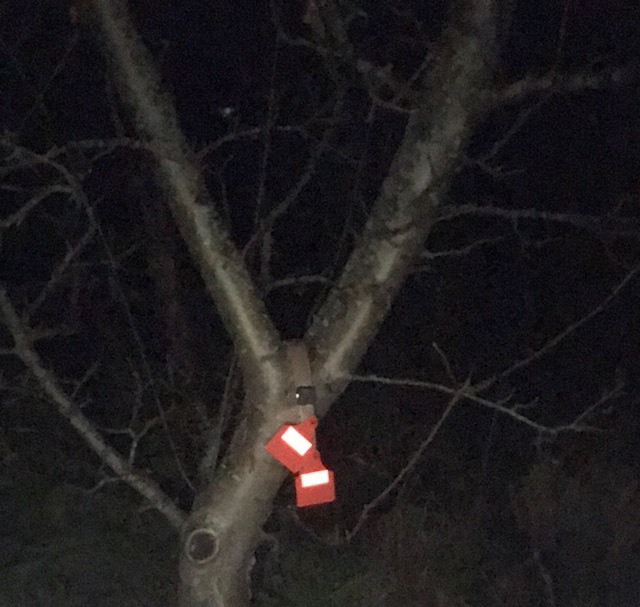 Reflective tags to mitigate nightly vehicle mortality and colour coded to identify individuals at a distance. 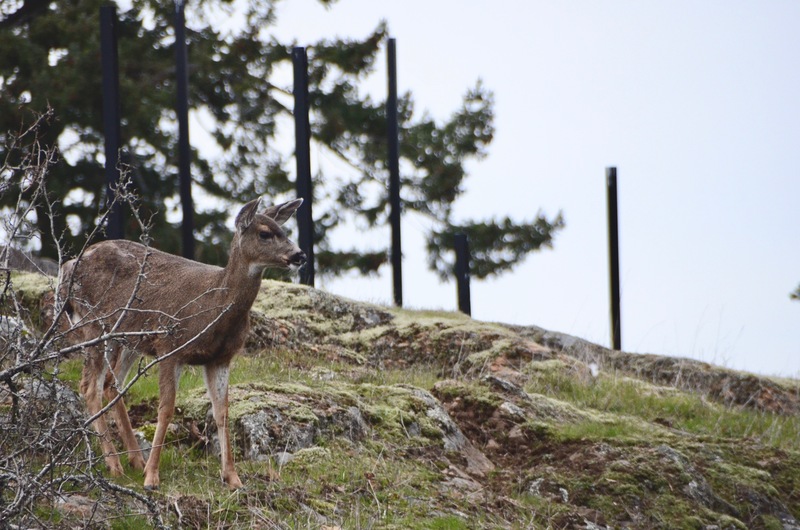 Already the Society has remote wildlife field cameras placed strategically throughout Oak Bay. The colour coding will allow the Society to know who’s who when collared deer are captured on camera. 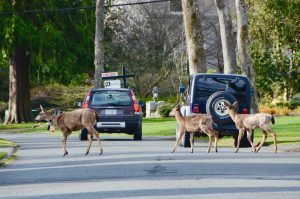 Having some individuals identified means that we can use cutting-edge spatial models to determine just how many deer are residents of Oak Bay. Now back to the chilly morning. We’re eager with anticipation, mapping out each of the three teams respective routes. I’m vying for the coveted Uplands circuit, with meadow-like front lawns, meandering streets, and minimal traffic – perfect for scouting out deer. Instead, my team draws the short straw and we head south, into neighbourhoods where houses are packed a little closer and deer are more difficult to spot. After a half hour of driving we decide that a little jaunt around Blueberry Hill is sure to rustle up a doe. It doesn’t, but the rising sun and the fresh air almost make up for it. 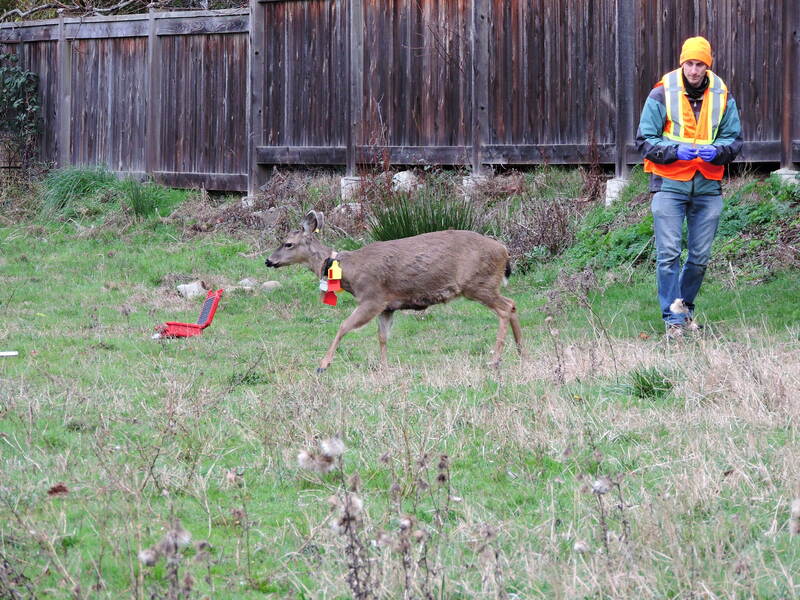 And then we get the call – another team has a doe in sight, the vet is getting close to darting her, and we race back to the car so as not to miss the shot. 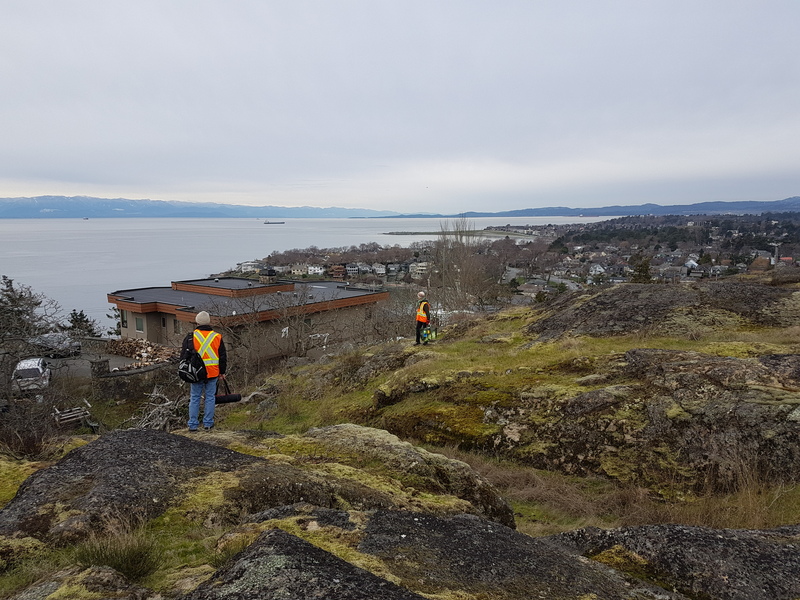 When we arrive, the doe is gently sleeping on a grassy knoll and the team is quietly, but efficiently, working to take samples and attach some shiny new bling. Before you know it, the first doe has been collared and we all give her a very wide berth as the vet administers a reversal. Within minutes, she’s lifting her head, glancing in our direction, a little groggy but not looking too fussed. A minute or two more and she decides to make her way over to a tasty looking patch of grass, slightly shaky legs at first but by the time we’re back in our cars she’s happily munching away, not much different than before, except now with a pretty necklace.